Cheryl Turpin is one of the many Democratic candidates running to retake the Virginia House of Delegates this November 7th. She's looking to us to help get out the word and build up momentum! We have two phone banks lined for this weekend and next week, with more on the way. We'll send you the address and directions. Bring a phone AND computer or tablet. Both phone banks will be making phone calls for Cheryl Turpin. Code Blue's Action page has all the resources you'll need to support Cheryl. RSVP and spend some time with fellow volunteers, or make calls from home and send us a selfie! In November 2017, Virginia's entire state house of representatives is up for election. This gives us a huge opportunity to retake Virginia's state legislature! Code Blue has a great feature introducing some of the candidates running in this election, and Cheryl Turpin is one of those candidates. If Cheryl Turpin sounds familiar, you likely heard of her when she ran for this seat in last January's special election. With the help of Code Blue, Cheryl came within 350 votes of winning in a historically Republican area! You can read more about her at Code Blue's feature introducing the Blue Crews for VA, and at Cheryl Turpin's Code Blue Candidate Profile. If you want to get involved, you can sign up to crew for one of the candidates. Once you do, you'll receive a message from that candidate detailing how you can help, and updates as the campaigns develop. Code Blue -- What have we accomplished so far? 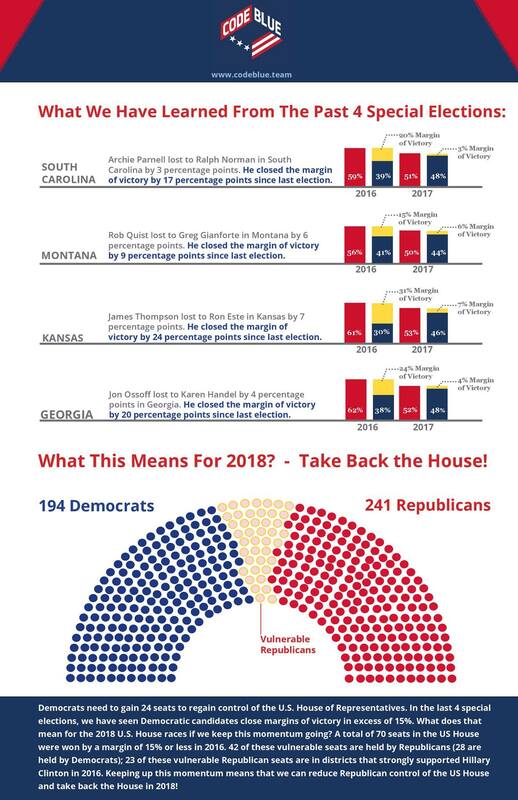 Over the last several months, we fought hard in four special elections to fill seats vacated by Republican Congressmen leaving their seats to take positions in the Trump administration. These elections were meant to be easy wins for Republicans, yet they proved to be hard fought wins. Ultimately, we lost all four seats but those losses should not overshadow the enormous ground that was gained in each of these elections. In each race, Democrats eroded Republican margins of victories to single digits in deeply red districts that many had written off as unwinnable. We forced Republicans to spent money to fight for seats that they took for granted. What does the resurgence in grassroots organizing and civic engagement signal for the 2018 congressional elections? If we can maintain this momentum, we have real opportunities to regain Democratic control of the U.S. House of Representatives in 2018! The data and design team at Code Blue produced the above graphics that link the gains we have achieved to what is possible in 2018. We know some of you are still reeling from losing of the special elections but we at Code Blue see what was achieved as harbingers of hope, testimonies to the success of grassroots organizing and a rallying cry for 2018.